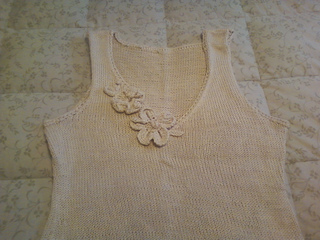 Pattern Summary From the magazine, “Romance blooms unabashedly on the ethereal tank, whose deep rounded V neck brims with crocheted flowers and leaves”. Additional Yarn Information For crocheted flowers and leaves an additional ball 136yds(125m) of 2 different colours are required. Additional Needle Information A G(4mm) crochet hook is also required.